One of our most popular personalized pocket knives for groomsmen! 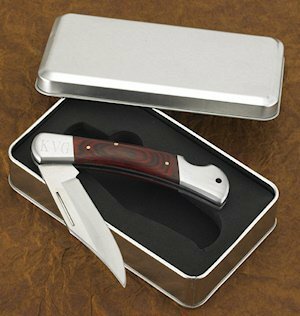 Your favorite outdoorsman will love this handy personalized knife, with a wooden handle that makes it ideal for fishing or hunting trips. Handsomely gift boxed and adorned with silver accents, the knife can be personalized with three initials. Knife measures 5" by 1 1/2" by 3/4", gift box measures 6 1/4" by 3 1/2" by 1 1/4".